Erlend and the cat are finally arriving in Portland this week and I am beyond excited! I've spent the last few months living by myself in #casahummingbirdhigh; while I've hardly noticed because I've been so busy with managing all the contractors for the house updates/remodels and chipping away on #weeknightbakingbook, I occasionally catch myself doing things in public that I've forgotten are socially unacceptable. You know, things like walking around in my hip neighborhood wearing polka dot sweatpants tucked into the colorful socks pulled all the way up to the middle of my shins; giving my friend a very obvious and not-at-all hidden look of disgust when a random dude tries to mansplain the new GOP tax bill (poorly and inaccurately) to us; subconsciously picking my nose in public. But I'm okay, I swear. I'm gonna keep today's post short and sweet because I know that everybody is probably super busy and getting ready to holiday it all out. If you follow me on Instagram, you'll know that I'm mildly obsessed with the poll feature on Instagram Stories and have used it to gather information about the types of content you want to see on this blog (more travel and home decor posts, apparently!) to whether or not I look cute in a bandana. One of the polls I did was around dulce de leche: did you guys want a dulce de leche brownie recipe, or dulce de leche cheesecake bars? 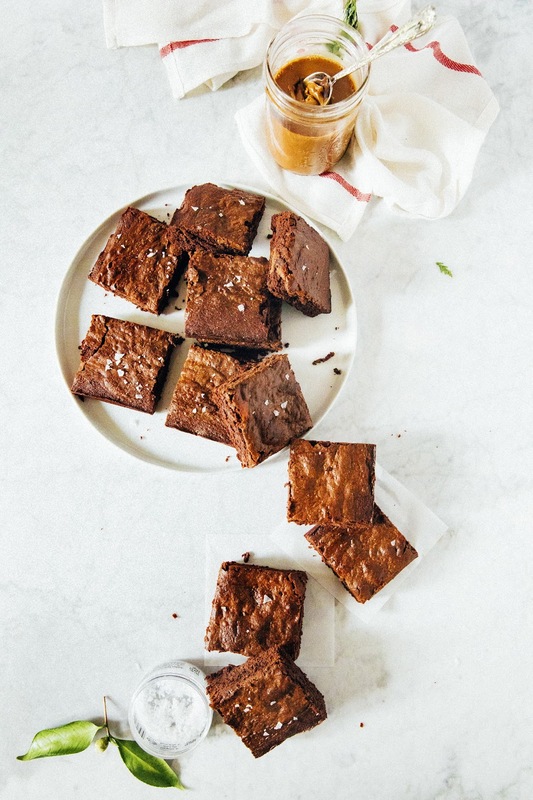 Dulce de leche brownies won out by a statistical hair (even though I was personally leaning towards cheesecake bars myself), which is how we ended up with this recipe today. 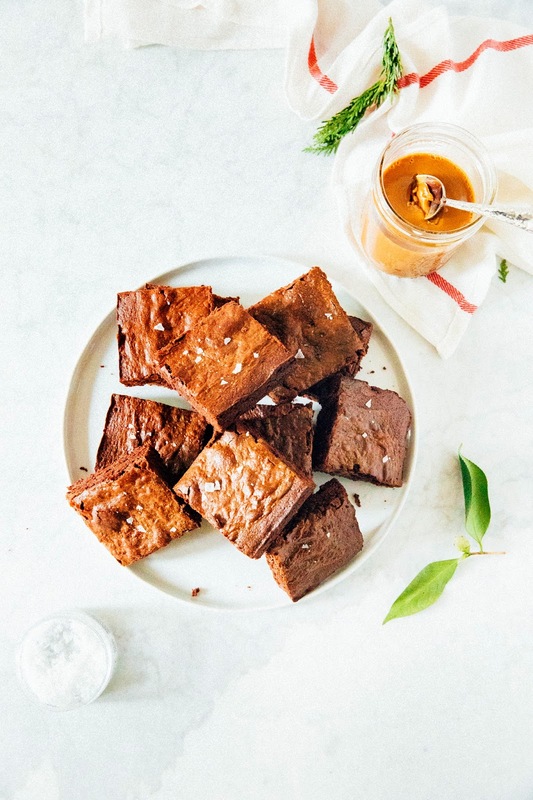 These brownies are delicious, and are based on a vintage Hummingbird High recipe circa 2013. They're best around 30 minutes out of the oven, when both the brownie and the dulce de leche are still a little bit on the soft and gooey side. And did I mentioned that I was DIYing all my presents this year? So far I've been putting together packages of dark and stormy sugar cookies, mini growlers of my very own homebrewed beer (Hummingbird HI-P-A), and little mason jars of homemade dulce de leche. It's actually insanely effortless to make dulce de leche at home — I used the easiest recipe from Martha Stewart's newish Slow Cooker book. All it literally involves is pouring cans of sweetened condensed milk into mason jars and forgetting about it in the slow cooker for 8 hours. 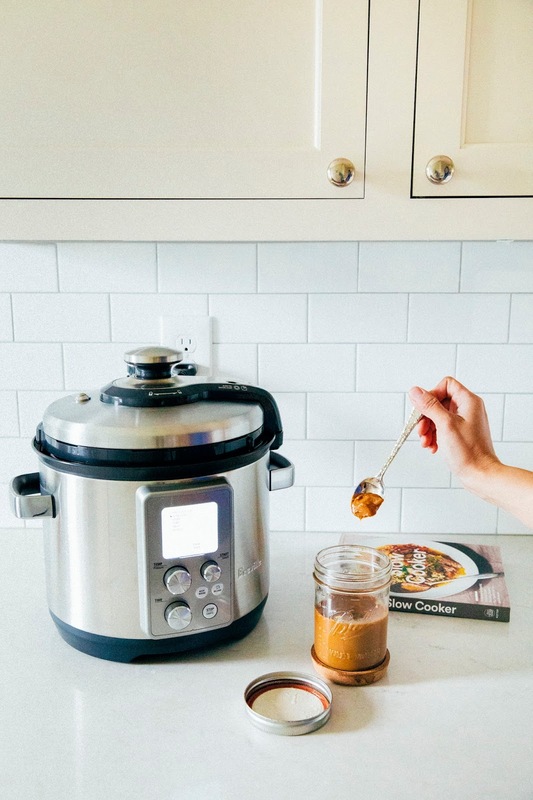 And, if you have a slow cooker that doubles as a pressure cooker (like this amazing one from Breville, which Kenji describes as "the Cadillac of pressure cookers"), you can do it in half the time. A big thanks to Clarkson Potter and Breville for providing me with a copy of Martha Stewart's Slow Cooker and Breville's Fast Slow Pro Pressure Cooker! 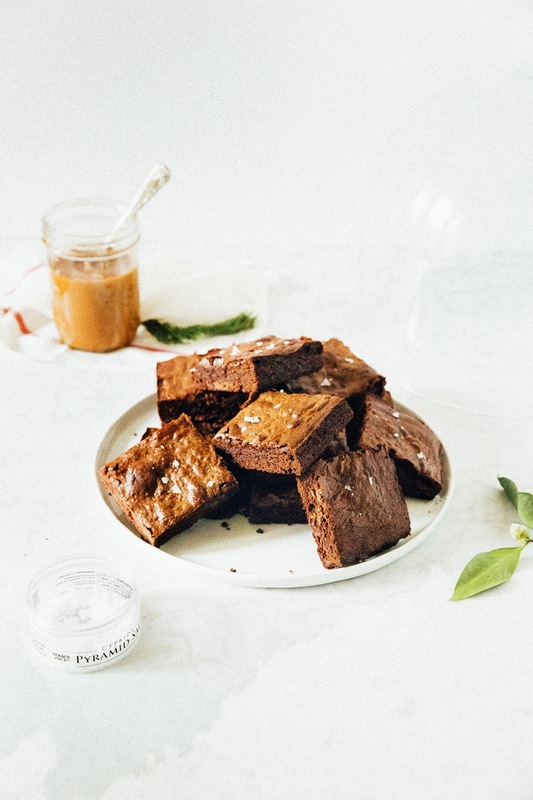 The dulce de leche recipe makes more than what's needed for the brownie recipe; you can use the rest will keep in the refrigerator for around 3 weeks. Use the leftovers for ice cream or eat it by the spoonful when you really need something sweet — I won't judge. Note that dulce de leche is easier to work with when it's warm. I recommend microwaving it on high for a few seconds at a time to get it pliant and pourable. This recipe uses 100% unsweetened chocolate, which is literally just chocolate without any added sugar. The dulce de leche makes things pretty sweet, so it's important to use the unsweetened chocolate to keep things pretty balanced. If you insist on using regular chocolate, I suggest going with a bar that is at least 70%-cacao. 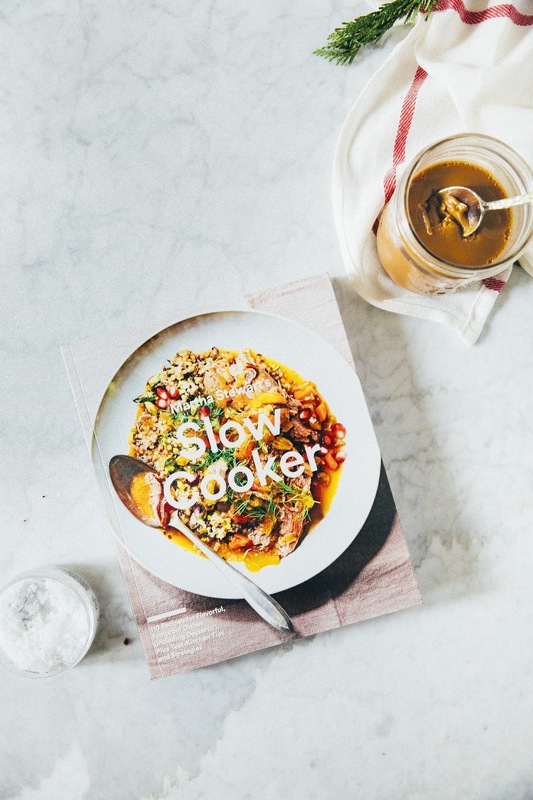 Preheat a 5- to 6- quart slow cooker. Divide 2 cans sweetened condensed milk evenly amongst 4 half-pint canning jars (8 ounces each); secure lids and rings on each. Place jars in the slow cooker, spacing them at least 1 inch apart. Fill slow cooker with boiling water to cover jars by 2 inches. Cover and cook on low until desired consistency is reached, 8 to 10 hours (or on high for 4 to 5 hours); the longer the cook time, the darker the caramel becomes. Turn off heat, uncover slow cooker, and let water cool to room temperature before removing jars. Once cool, carefully remove jars, rinse, dry, and refrigerate up to 3 weeks. Center a rack in the oven and preheat to 350 (F). Prepare a 9 x 13-inch baking pan by spraying with cooking spray and lining with parchment paper; spray the parchment paper as well and set pan aside. In a double boiler (or make a homemade version with a heatproof bowl sitting on top of a saucepan) over medium heat, combine 1 cup chopped unsalted butter and 8 ounces chopped unsweetened chocolate. Use a heatproof rubber spatula to stir the mixture constantly until melted and completely smooth, about 5 minutes. Remove from heat and set aside. In a medium bowl, whisk 4 large eggs. Add 1 cup granulated sugar, 1 firmly packed cup dark brown sugar, 2 teaspoons pure vanilla extract, and 1 teaspoon kosher salt. Whisk until fully incorporated — the mixture should be a golden tan color. Whisk in the melted butter and chocolate mixture (from the 2nd step). When the mixture is a uniform dark brown color, use a rubber spatula to fold in 1 cup all-purpose flour. Be careful not to overmix during this part! Simply fold in until the flour is incorporated and the last streak of flour disappears into the chocolate. Pour half the batter into the prepared pan. Drop half of the dulce de leche by the spoonfuls across the brownie batter. Drag a butter knife through the mounds to swirl them slightly into the batter. Spread the remaining brownie batter over and spoon the remaining dulce de leche in dollops over the top of the batter, using the butter knife to swirl the dulce de leche into the batter again. 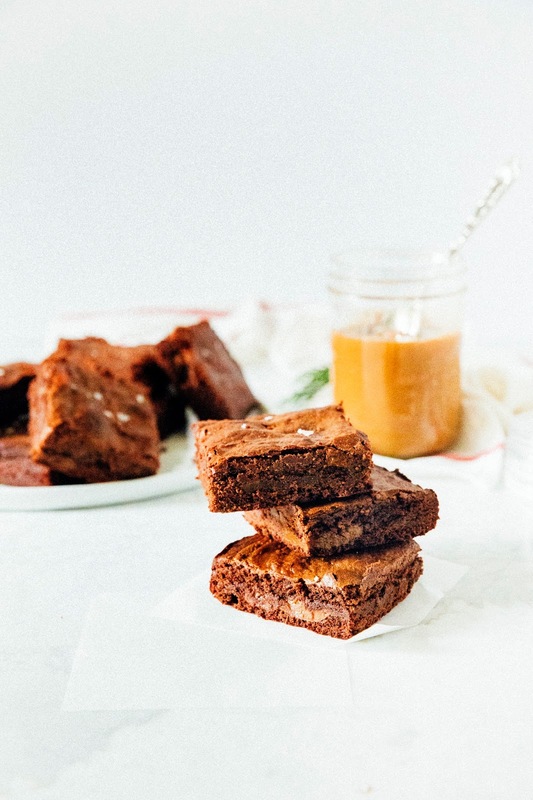 Transfer to the preheated oven and bake for 40 to 50 minutes, or until a toothpick inserted into the center of the brownies comes out with few crumbs. Transfer to a wire rack to cool completely before slicing and serving. Enjoy!